The most exalted watch houses are moving away from the “shrink it and pink it” attitude of the past and developing serious watches for women, finds Avril Groom. What women want from watches is not necessarily what the men who have traditionally made them create. A decade ago, when most executives and designers in the industry were male, the attitude to designing anything other than a small quartz watch for women was “shrink it and pink it” and maybe add a few diamonds—in other words, pretty up an existing men’s model. That they even thought about it happened because women were taking matters into their own hands—buying, or borrowing from their menfolk larger, plainer watches perhaps with a visible extra function (the chronograph became a fashion) and invariably with a mechanical movement usually visible through a sapphire crystal case-back. At first their appeal was primarily aesthetic. Modern women wanted big, bold styles that reflected their growing power in the workplace and were a break with the dainty timepieces worn by older generations. Soon they realised that the hand-assembled movements driving these models were fascinating in themselves as an example of traditional handcraft with more “soul” than a battery-powered quartz model. Mechanical watches from top brands, especially those with extra functions, have long been expensive status symbols, which women also appreciate—people like the City high-flyer I met who bought a beautiful Patek Philippe, diamond-trimmed ladies’ moonphase, partly because she knew how much comment it would cause in the boardroom. Patek Philippe was early in seeing the potential in the women’s market and each year adds a new women’s complication (a term that denotes a watch with extra functions besides telling simple time). Last year, for the first time, the Best Watchmaker Award at the Grand Prix d’Horlogerie de Genève went to a woman—Carole Forestier-Kasapi, the head of technical development at Cartier. The brand’s deep pockets have helped her develop stunning innovations, including her skeleton version of the Santos, where the fretted bridges form the Roman numerals, or a delicate engraved bird coiled round a tourbillon. The newest is its first in-house chronograph movement. Cartier has placed huge confidence in her to develop the brand’s haute horlogerie side—she sees a firm place in this for complicated women’s models quite distinct from men’s. As she recently said: “A woman who can afford such a watch expects it to make her dream. What makes men dream is technique, but what makes ladies dream is magic.” That she naturally assumes women will buy such fiendishly expensive items for themselves shows how far women’s mechanical watches have come in the past decade. 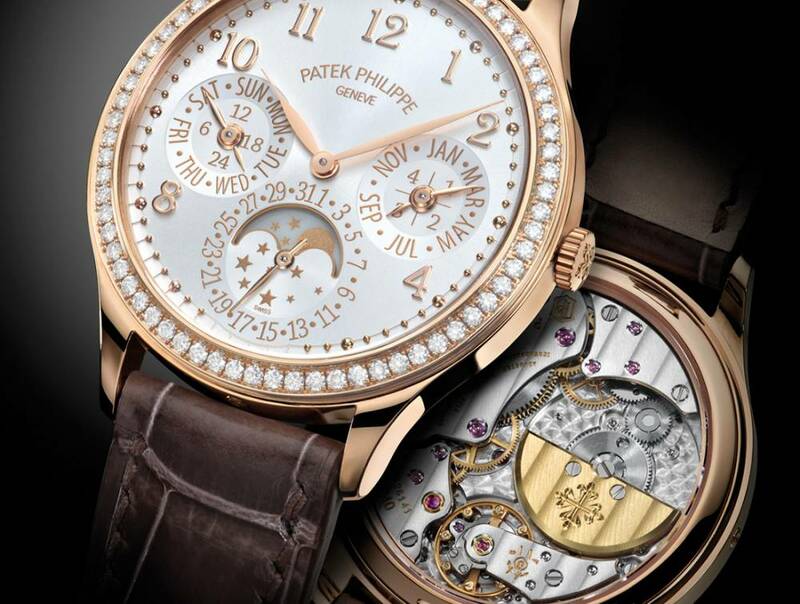 Patek Philippe has also taken the idea further—its series includes distinctly feminine versions of serious complications, including a perpetual calendar and a minute repeater, while the 2012 moonphase introduction, with its bezel of spiralling diamonds, marries the best of horology and gem-setting in an irresistibly feminine mix. Other brands have joined the bandwagon with ingenuity. 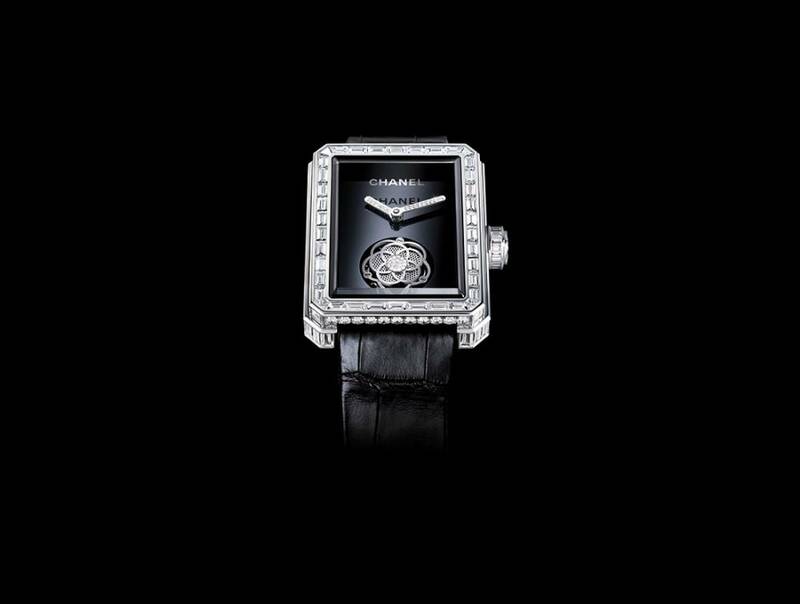 Chanel’s beautiful Première Flying Tourbillon, where one of the most complex movements spins a delicate, house-signature camellia as it rotates, is another winner. Meanwhile, the automatic movement has become the norm for many good-quality brands, from Zenith’s elegant new moonphase to Jaeger-LeCoultre’s highly handcrafted new Rendez-Vous with its poetic day/night function. Even the current crop of wide-appeal, simple, round models, such as Omega’s phenomenally successful Ladymatic, eschew quartz. Company president Stephen Urquhart told me when it launched that he sees automatic models as the way forward for the brand’s feminine styles. 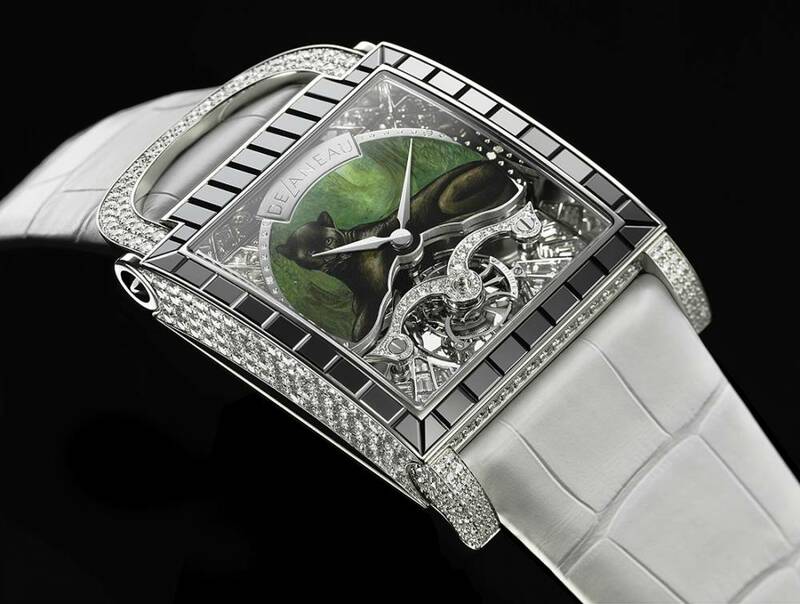 Houses with a jewellery heritage, wedded to quartz in the past, appear to agree, with examples like Boucheron’s Cypris, a unique cuff featuring two jewelled swans with Girard-Perregaux’s famous Three Gold Bridges movement, or Harry Winston’s Ocean Lady Bi-Retrograde. 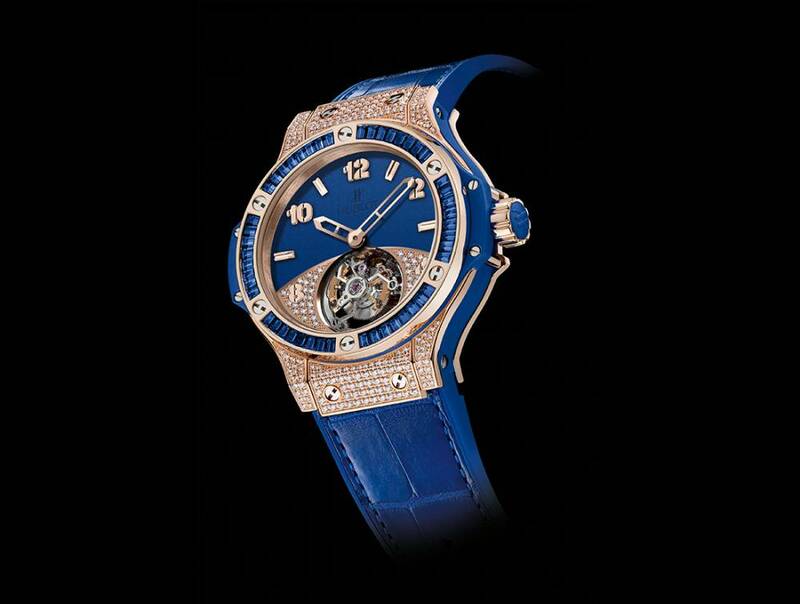 Some designs are quirky, such as the Tutti Frutti model of Hublot’s bold Big Bang tourbillon with its playful coloured-stone baguette bezel; the unique Roue Carrée movement from Maurice Lacroix in soft rose gold; and Louis Vuitton’s women’s version of the Spin Time with its rotating diamond cubes. 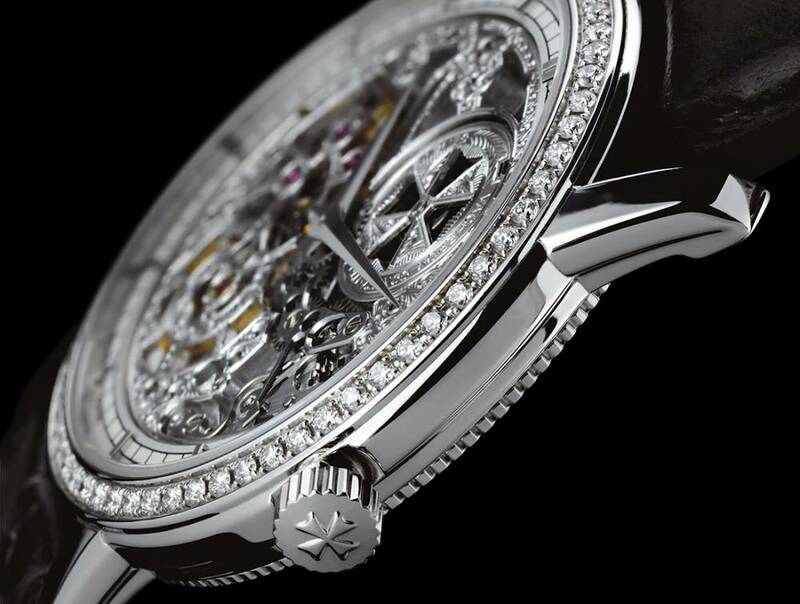 Other watchmaking devices with feminine appeal, like the skeleton, are not strictly complications but, when allied to an ultra-thin movement (Piaget’s Altiplano Skeleton gemset) or superb engraving (Vacheron Constantin’s Patrimony Traditionnelle Openworked) become worthy of the name. One of the simplest innovations is also one of the most effective—moving the rotor of an automatic model to the front and decorating it to provide both motif and motion. Examples include Cartier’s Promenade d’une Panthère, with its slinky spotted diamond beast that walks as the hand moves, or Piaget’s Limelight series—the newest model, Four Seasons, features bees and ladybirds dancing on a blue sky. There’s also the Dior VIII Grand Bal numbers, with diamonds swinging like chandeliers and bridal lace, or set with tiny feathers. Such items are nowhere near the price level of tourbillons but they too serve a noble purpose—bringing complicated women’s watches to a wider audience and helping to make them an indispensable part of horology.